4 November 2016 – The Saudi Association for Civil and Political Rights (ACPRA) was formed seven years ago this month by a diverse group of activists united in the goal of spreading human rights awareness and advocating for constitutional reform. 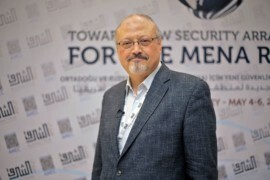 Its eldest member, Suliman al-Rashudi brought decades of experience in Islamic law and human rights to organization, strengthening the groups’ ability to challenge government injustices in a manner which resonated in Saudi society. Suliman al-Rashudi is an 80-year-old judge and former president of ACPRA. He has been on the front lines of promoting civil society and human rights in Saudi Arabia for over two decades. In 1993, al-Rashudi, along with ACPRA cofounder Abdullah al-Hamid helped establish one of the first independent civil society groups in Saudi Arabia, the Committee for the Defense of Legitimate Rights (CDLR). Authorities arrested al-Rashudi for the first time for his role in founding the CDLR and banned him from travelling outside the country. Undeterred, al-Rashudi in 1995 led the first known demonstration in the conservative Najd region of Saudi Arabia on behalf of the rights of detainees. The talk was uploaded to YouTube on 11 December 2012. The next day, authorities arrested al-Rashudi and the Court of Appeal subsequently sentenced him to 15 years in prison for “breaking allegiance with the ruler,” “cooperating with outside organizations,” and other charges that arose entirely from his peaceful exercise of his right to freedom of expression and association. Despite his age, Saudi authorities have severely abused al-Rashudi. Over the course of his detainments, al-Rashudi has been held in solitary confinement, tortured, and denied access to medical treatment and legal representation. Al-Rashudi is currently serving his sentence at al-Hayer prison near Riyadh. The international community continues to condemn his unlawful imprisonment and advocate for his release. However, it remains uncertain whether al-Rashudi will get to spend his last few years experiencing the freedom he has dedicated his life to.